Jimmy & Bugambilia replaced Flamita & Willie Mack. Terry suffered a shoulder injury. Pierroth got involved, which might have caused the DQ. Building looked about half full; I suspect DTU will end up drawing better for their own year end show in this building in a couple weeks. CuadrilateroTV says Black Terry suffered a shoulder dislocation. It was initially thought he might need an operation, but the doctor fixed it and he’ll only need some rest. Nicho made a surprise return, taking Daga’s place and wearing his Psicosis gear. After the match, Rush said he only wanted to defend his hair against LA Park’s mask, which Park brushed off – he felt he had Rush beat in Arena Mexico and CMLL stopped the match to save him. Park teased restarting the LWO (!?!) with Psicosis. Looked like another full house or close to it. They’re still really strong in Tijuana, where they’ve had a year of good shows (as opposed to just debuting and not being known well everywhere else.) They teased the cage match in January heavily enough that I guess that might actually be happening. Semimain was said to be very good but the finish was strange. No Ultima Ninja. The match was changed around to have Zorro & Sharlie teaming, only they didn’t get a long and that caused them to lose. That’s a decent turnout considering the WWE show (which seemed to draw well), the CMLL show (which did not), and even AAA running in Neza (which was around half full, about what you’d expect.) The results don’t interest me much; the last four finishes being interference, team break up, draw, and rudo cheating doesn’t seem inspired. There were cameras at ringside shooting the show, but I guess I don’t know if they were Azteca or +LuchaTV or someone else. Elite didn’t appear to give any date of when this would air on TV Azteca, or say much at all. There are some CMLL shows you might as well skip. This is one you definitely should skip. The undercard was largely boring when it wasn’t bad, and the main event was a sloppy disappointment that nearly completely derailed. Mephisto needs to stop going to the second rope because it’s not working out for the people he’s with. Caristico mentioned he was hurt on Twitter after this match, which is probably mean to be his explanation for his own shaky performance. CMLL’s pushing Niebla Roja stronger after the Anniversary show (which is more a reflection about how badly that was messed up), and they have him doing every Hector Garza spot they can think of. Arena Coliseo Guadalajara has a Facebook post up teasing the son of a legend debuting soon. The commenters think it’s Atlantis’ son, and they might be right. AAA tapes in Xalapa. AAA’s matches haven’t changed as much from their lineups on the last couple tapings, and there’d will be two title matches if that holds up here. Villano III & La Hiedra, who previously lost to Big Mami & Nino Hamburguesa in a non-title match, will challenge for the mixed tag titles. Cuervo & Scoria will get a rematch for the regular tag title against Murder & Monster Clown. The main is listed as a trios, combining the three main feuds: Psycho/Escorpion, Fantasma/Texano, and Wagner/Mundo (using Hernandez as a stand in.) This is the second to last taping of the year, with another to come in two weeks. FWIW, last week’s TV announced Guerra de Titanes would be in Mexico City in January, but didn’t give a location or a date. Still guessing the weekend of the 21st in Gimnasio Juan de la Barrera. Arena Coliseo has a very rare defense of the Mexican Lightweight title. Electrico figures to retain over Pequeno Nitro, but CMLL hasn’t made it mean anything to anyone besides those two people. Jun Kasai has the first of his two matches in Mexico in Monterrey’s NGX. He teams with Joe Lider to face Pagano & Violento Jack, which is why Pagano is not part of the TV taping. The finals of the Matematico nuevo valores tournament happens in Mexico City. I am not sure who’s left, but I know the Furia de Titanes Facebook page was covering this with (live?) video last round, so it might be something easy to watch. 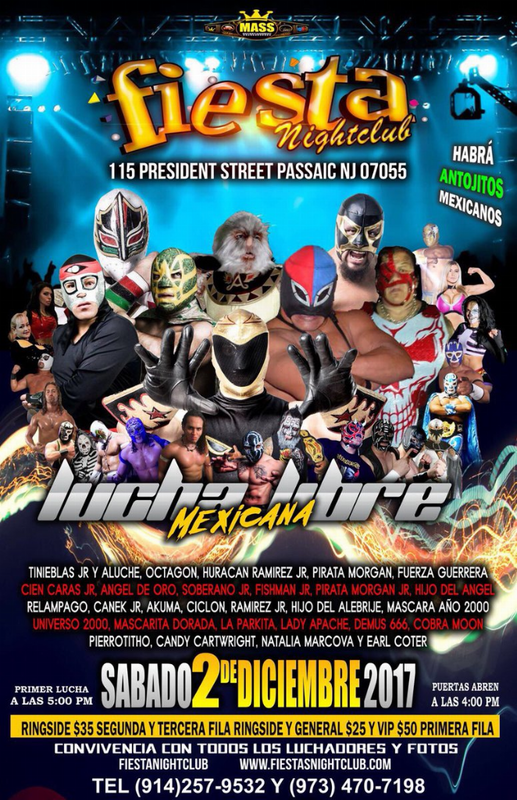 The same luchadors who were in New York last night head to New Jersey today. DTU brings Jun Kasai to Arena Lopez Mateos. He’ll team with Crazy King against Ciclope & Miedo Extremo; those three were a unit before Crazy King broke up with them a little while back. The semimain is Violento Jack versus US wrestler Jimmy Lloyd. The Crash debuts in Ecatepec. The main event is listed as LA Park, Penta, and Rey Mysterio versus Carlito, Garza, and La Mascara, but I don’t think they’ve had a main event go exactly as listed yet this week. IWRG celebrates Pirata Moreno start of promoting shows in Mexico State 55 years ago, on a day where they may have the third most interesting show in Mexico State. Main event is Mr. Electro against Ray Mendoza Jr. (Villano V) in a hair match, in Mendoza’s first match in two years. That won’t be pretty. They also have a three way tag match, where the winning duo will have a mask vs mask match in two weeks. They’ll have a fan fest before the show at 3, which is unusaul for IWRG. CMLL’s main event of Dragon Lee, Mistico, and Volador take on Euforia, Gran Guerrero and Ultimo Guerrero sounds good. Not much going on with the show otherwise. An interview with Zacatecas referee El Coyote. The semimain is along the lines of Relevos Incredibles we’re used to this year: listed as one, but just really Los Ingobernables versus some tecnicos. The main event is the old version we used to get, which usually set up things. This is at least a tease of Mistico/Caristico again. Titan has never had a singles match with this Dragon Lee, but he did long ago have one with the original that was pretty fun. This should be too. The Shockercito/Mercurio feud is interesting, because I thought they had hit their limit of apuesta matches. Maybe a third one on the Friday before Three Kings Day (01/05)? 1) Greco Baez vs Vazco Jr.
5) Xtreme Tiger vs Ninja Jr. This is a very random lineup; I think there must be another show pulling away talent from this one, because the main event just looks weird. The WWA Welter is the Todo x el Todo belt, so Santo being in the main event is probably why Bandido is defending it here.